Not Exactly Cooperstown is the story of the Baseball Reliquary, a left-coast complement to the National Baseball Hall of Fame in Cooperstown. The Reliquary celebrates the great stories and characters that have impacted the landscape our of our national pastime, as well as fostering an appreciation for American art, culture and history through the lens of baseball. Quick, Name the baseball hall of fame that allows fans to vote. It's a hall that has room for players like Curt Flood, Jim Bouton, Jimmy Piersall, Josh Gibson, Bill "Spaceman" Lee, "Shoeless" Joe Jackson and Dock Ellis. This hall also hands out annual awards to deserving fans, historians and researchers. Give up? It's the Baseball Reliquary, and it's not exactly Cooperstown. 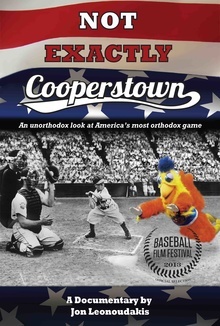 Join award-winning documentary filmmaker Jon Leonoudakis on a star-spangled journey into the heart and soul of baseball, and enjoy an unorthodox look at America's most orthodox game.